The comedy actor and former New Girl star wrote on the Fourth of July, "Happy white people proud of their racist ancestors day." Damon Wayans Jr. stirred the wrath of many Twitter users when he made a joke about America's Independence Day. The comedy actor and former "New Girl" star wrote on the Fourth of July, "Happy white people proud of their racist ancestors day." More than 1,100 people liked the tweet, while more than 1,200 replied to it. And many were pretty angry. "Just another example of Hollywood talking down to Americans. They hate this country & their fans. #FabricatedRacism sadly returns @wayansjr," replied user @ViperNTheTemple. "A joke some took too personally. So what. Jokes aren't illegal," Wayans replied. Many people definitely did not see his tweet as a joke. "Not illegal, but offensive & hateful," wrote user @WTPatty. "When I think of all the men and women who have died for our independence, laughter does not come to mind," wrote user @ricknjan. "Unbelievable. You just live in the best country in the world. You should thank God that you live in America," user @jamesdudley45 said. "Enjoy what's left of your already s--tty career that your dad created for you," wrote user @JasonSMoonen. "Thanks Jason :) . Will do :)," Wayans replied. "Yep, it was a joke," he told another critic. "But feel free to be offended by it. 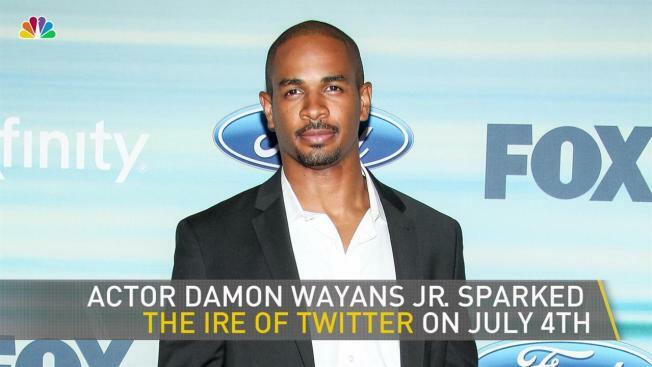 ;)"
Original Post: Damon Wayans Jr. Stirs Anger With 4th of July Joke About "Racist Ancestors"